4.7% scored Radical Libertarian out of 60410 total takers for the new Version 7. 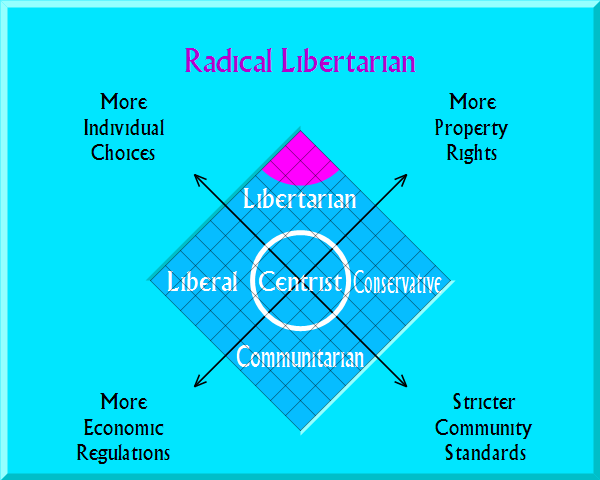 9.6% scored Radical Libertarian out of 302551 total takers for the old Version 6. You like your government very, very small—or none at all. You are a real libertarian. Want to run for Congress? State legislature? You might want to join the Libertarian Party and they'll put you on the ballot. Put in some effort and you could be state chair in a couple of years. Whether this effort is worthwhile is debatable. Back when I was a party member I wrote these Essays on World Liberation in the hope of turning the LP into a real political party. Though I have mellowed out since those days, and focus on higher-probability strategies, I still find I cannot resist the temptation to write on libertarian strategy, but be forewarned: some of the lessons I have learned are rather hard. This is a year of mixed blessings and curses for radical libertarians. On the one hand, the Republicans have dropped all pretense of being in favor of smaller government -- at least at the top of the ticket. Meanwhile, the Libertarian Party has nominated a pair of former Republican governors who are doing a terrible job of explaining libertarian theory. On the other hand, Gary Johnson could actually win. This wouldn't result in Libertopia, but it would end the War on Marijuana, reduce foreign intervention, and reign in some federal spending. Keep in mind that Gary Johnson's hard tack to the left is in order to go after the Bernie voters. Or you might want to play John Galt and wait for civilization to collapse. Your call. Imagine smaller government -- or none at all. It can be fun, or a downright wild ride (in the case of Snow Crash ). For this reason I present you with a list of libertarian utopias for your reading pleasure. The page also includes some satire and dystopias to keep you honest. Expectation management is important, you know. Capitalism warning: if you buy using my links (including the picture links) I make a small commission from Amazon. If this upsets your inner socialist, go visit a physical bookstore, or search for the titles manually. Your views are frankly outside the mainstream. If you don't have the patience to wait until the mainstream adopts your views, you could move to a small state where other radical libertarians are congregating: New Hampshire. The Free State Project has not achieved its original goal of getting 20,000 libertarians to commit to moving, but many libertarians have moved anyway. Take Back Your Government, by Robert A. Heinlein. A handbook for grassroots political activism from the days before professional consultants and television. Dated, but still useful. Dedication and Leadership by Douglass Hyde. An inside look at how the Communist movement was so successful in advancing its radical agenda. Many of the ideas are apropos for building up the political movements in general. Must reading for anyone doing third party politics. Many members of the axiomatic school of libertarianism often overlook certain hard questions/edge conditions, and thereby lose debates. Here are some readings (including a couple by an anarchist) that should prove helpful. The Machinery of Freedom, by David Friedman. This book looks at the economics of government itself. What are the incentives of those who govern? To what degree are they motivated to promote the general welfare? The answer: not very much. For this reason Dr. Friedman is an anarchist. But you don't have to be in order to benefit from this book. Indeed, knowing the inherent difficulties in making government behave is more important for those who like government big than for those who like it small. Law's Order, by David Friedman. OK, so you believe in property rights, right? So where does your property begin and mine end? Do I have the right to turn on the lights or do the photons that hit your property constitute tresspass? What if those photons come from a high powered laser? OK, that was an extreme example, but there are many real world examples where the simplistic view of property rights fails. Dr. Friedman gives them a hard look. People will take your ideas more seriously if you do too. Simple Rules for a Complex World, by Richard Epstein. It would be nice to simply say that private property is good and that initiation of force is bad and build a legal system based on this dictum. Alas, the real world is not so simple. Legal scholar Richard Epstein points out the holes and suggests additional axioms to make a complete legal system for a free society. Fuzzy Thinking, by Bart Kosko. Fuzzy Logic is one of the biggest advancements in philosophy to come around in a long time. It deals with the imperfect mapping between words and reality. Must reading for the philosophically inclined, especially followers of Ayn Rand or Murray Rothbard. A Perfect Mess by Eric Abrahamson and David H. Freedman. Does your office have a clean desk policy? Does it try to document all processes in the name of efficiency? Are planners trying to remake your home city? Do you think that the laws should be based upon a clean axiomatic framework? This book provides a powerful antidote to such thinking. Reality is multi-dimensional, and the results can be...messy.